The first week of summer vacation is almost behind us and it is nothing that I imagined it would be. Definitely not a walk in the park. We have suffered through drama, tears, and fist fights. I think my boys will remember this week as the worst start to summer that they have ever had. It all started with goals. I made the goal to have my 7 and 10 year old’s deep clean their room. I told them they couldn’t go out to play until it was clean, quoting the verse 2 Thessalonians 3:10b“If anyone is unwilling to work, he shall not eat.” Of course, I applied this to playing instead of eating. (My children ate three meals a day this week) Monday morning we started out strong. By Monday evening, it still wasn’t clean and we had endured lots of fighting. So we made cleaning our goal for the next day. Tuesday morning we were out of the house so after lunch they started cleaning again. Until the fighting started. I made one clean while the other one read in a separate room. And vise versa. Wednesday rolls around and they are still cleaning but this time anger is building and everyone is annoying everyone else. How many times can I check a room that is supposedly ‘clean?’ At this point in my week, I have barely accomplished anything which is driving me mad! Every 5 minutes I am answering questions about what classifies as a personal item and what bin does my Nerf bullets go in? Seriously, just put them in a bin. Any bin. You choose! After denying them ‘clean room’ status for the hundredth time (literally), I could see the steam rising from both my boys. I get halfway up the stairs and my youngest makes a few painful squeals before launching into a battle cry. Obviously curious, I crept to the door to see my youngest pounding my oldest with his fists, who is curled up in fetal position on the floor. Needless to say, we had a lot of words and not just with me but with Daddy, who was at work. It was a rough few days but I think things are finally looking up. They have achieved ‘clean status’ and are proudly talking about their clean room as though it took little effort. I am wondering if they learned anything at all, seeing as they still drop their clothes on the floor right where they take them off. Meanwhile, I know what I need to work on this summer. Patience. Lots and lots of patience. 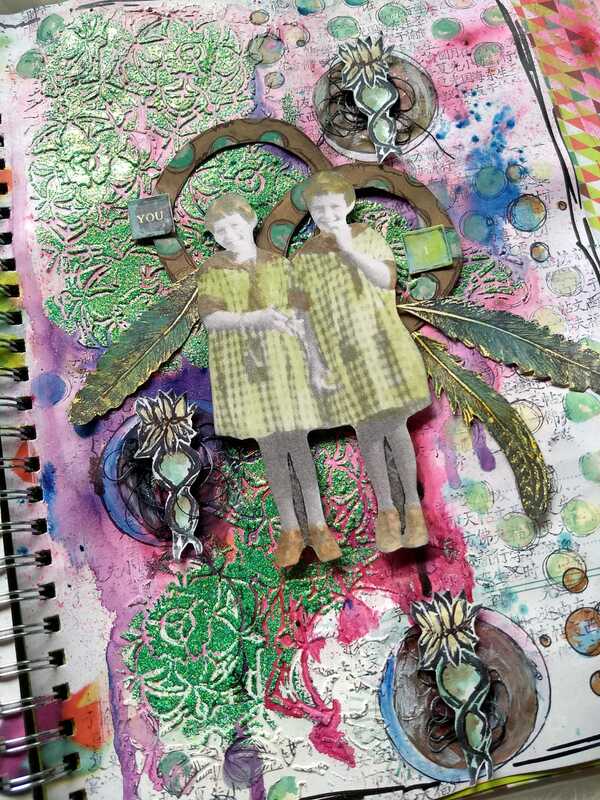 I don’t usually play along with challenges but I couldn’t resist when one of my fellow columnist at StencilGirl® started a challenge using field journals and weekly prompts using only StencilGirl® Products. As you can see, this first prompt is to use circles. This wasn’t easy for me as I don’t use a lot of basic shapes but I had fun and it was a challenge. Stencil-wise I used the Decorative 6 Petal Flower Screen in my background as well as a few circles from the Art Deco Peacock Feathers. The lotus is one of my recent hand-carved stamps that I can’t stop using. I made some copies of the TH paper dolls to use throughout my journals. The feathers are by PaperArtsy and the Chinese background is The Artistic Stamper. The paint in the background is PaperArtsy Infusions. So far, this is not a favorite layout of mine but as I went out of my comfort zone this is to be expected. I am looking forward to completing more prompts. If you want to see more of this challenge, check out #thestencilfiedjournal. This may not have been one of your favorites, but I certainly enjoyed it, I also enjoyed reading about how the title took shape, I am not sure what you were expecting, but I am glad the boys finally got their room cleaned, at least for a day, This is a marvelous spread, and I love those paper dolls, I never considered copying them, since I have so many. I might have to do that next time I want to use a particular image, and have time to cut it out. The thing is, it is so easy to not have to cut them out that makes them so attractive to me. Haha. I Agree, Elizabeth. I think that it why they are so popular. Cutting them out is most of the work. And if you don’t like cutting these are perfect. Even if this was out of your comfortzone, the spread is beautifully made and a feast for the eye! Wishing you lots of succes with the cleaning. I never succeeded in making them clean their own room,especially during puberty their rooms were a big mess. I made them do it, but it was a lot of hassle.. I probably started too late training them. Maybe you will have more succes in setting smaller goals per day. Hi Kate, I like your journal page very much, sorry it’s not one of your favourites. Hope the coming weeks will be more peaceful with family matters. It was not about when my kids were small, but I know many young parents who have found it very, very useful…..
Anyway- great circles and yes, out of the comfort is scary but can be done! Happy Monday and 2nd week of vacation! I always love hearing your stories. Time flies and the kids get older so quickly! My daughter now has her first fix boy friend and we have much fun all together.There are often difficult times with kids, but we have to just brave and think about how blesse we are with havibng them andwhen they are well. That’s the most beautiful gift we get!Wishing you patience! I love your pages dear Kate! ´They are wonderful!